¡Vámonos! : Reporting back from PLS #6 - ¡Mira Miró! Maria introduced the project, designed to be cross curricular, not CLIL (most is in English with some Spanish language), and lasting approximately 5 hours / half a term. 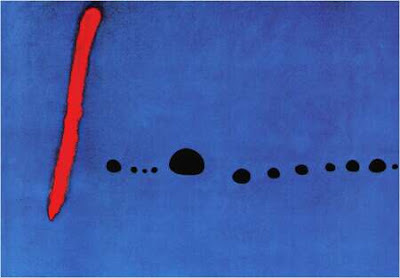 To explore the works of the Spanish painter Miró, using some simple Spanish to describe shape and colour. 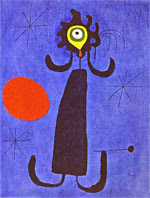 To prduce own art in the style of Miró and be able to simply describe and evaluate it. guess the name of the painting. Pupils looked at the painting on the right and discussed what they thought its name might be. they were encouraged to comment on the form, colour, texture, lines etc of the piece. The title is Ciphers and Constellations in love with a woman - does it suit the piece? What might be a a better name? The pupils also learned at this pint that Miró often shut his eyes and painted - interesting a nd quirky - perhaps they could emulate it? Looking at this painting (left) called Woman in front of the sun, pupils were asked to look for shapes - and this is where some Spanish vocabulary comes in as they describe the shapes they see. 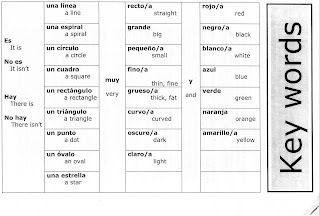 In the following lessons, they add adjectives of colour and size to the descriptions - eg hay un círculo grande y rojo. using cards containing images of shape, size, colour and form, we made human sentences, physically emphasising the noun / adjective word order. This could be extended with verb cards for Hay / No hay. Having been given a random selection of the shapes from the paintings, we discussed their properties, and then constructed our own picture. evaluation. NB accuracy of del / de la was modelled but not insisted upon as the flow of conversation and communication was seen as more important. Part of art is learning to appreciate it and the end stage was discussing how the painting made them feel. Words such as 'bueno' were banned - words like bonito, tranquilo, calma, alegre, triste, confuso, raro, enfadado were encouraged - I wasn't sure about the inclusion of 'horroroso' as an advisable word to describe another child's work though! Maria shared that the hope is to publish these resources on the wsgfl alongside the existing cross curricular packs on Animals and habitats, and Habitats in Spanish (there are also a wide range of French cross curricular resources including The Giant Turnip and the Little Polar Bear, and a couple in German), and also to cover a French artist, Matisse (in his later years his work is suitable!) At the moment, the stumbling block centres around copyright issues. I think this is another great idea for embedding PLL in the existing curriculum, and looking in a more 'joined up' way at children's education. Any other ideas out there?